Selected papers. General Features of Test Systems. Fields of use and advantages of test systems, terminology. Some history. Classification of test methods. General requirements and metrology. Limitations of test methods. Chemical Principles of Test Methods: Reactions and Reagents. Selection of reactions and reagents. Variants of reagent applications. Immobilization of chemical reagents. Matrices and methods. Catalytic reactions. Immunoassay procedures. Methods and Tools for Analysis of Liquid Samples. Paper strips and their analogues. Indicator powders. Indicator tubes. Tablets and similar forms. Regular ampoules and droppers. Self-filling ampoules. Titration kits. Other tools. Systems of Measurement and Registration. Requirements to methods and their classification. Visual methods. Colorimetric visual methods. Use of more sophisticated but still compact instruments. Measurement of colour. Titrimetric methods. Chemical dosimeters. Mini devices with built-in software methods. Test concentrators incorporating indicator powders. Methodology and Application Areas of Test Systems. Fields of use. Attestation of methods and their official endorsement. Sample screening. Determination of Inorganic Components in Water and Soil. Sum parameters. Cations. Anions. Other inorganic components. Determination of Organic Components in Water and Soil. Sum parameters. Petroleum hydrocarbons. Polyaromatic hydrocarbons (PAH). Organochlorine compounds. Polychlorinated biphenyls (PCB). Various pesticides. Other organic compounds. Analysis of Air and Vapours. Analysis using indicator tubes. Application of pocket analysers. Detection of Alcohol Vapours, Narcotics, Chemical Weapons and Explosives. Alcohol vapours. Narcotics. Chemical weapons. Explosives. Use of Test Methods in Medicine. Determination of glucose. Testing for cholesterol. Other medical applications of test methods. Drug control. Some other Applications of Test Methods. Determination of gold and silver by the touchstone. Use of test methods in education. Conclusions and Perspectives. Chemical analysis moves from laboratory to places where samples to be analysed are located. This trend is aptly termed "on-site analysis". As the dictum says: "from sample transfer to information transfer". Owing to the ever increasing number of samples to be analysed, preliminary screening and selection of samples seems to be necessary, even in the laboratory. Rapid test methods of chemical analysis can solve both these tasks. 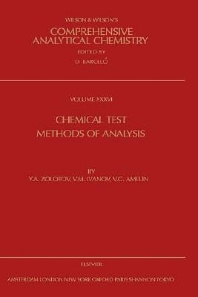 This book is devoted to test methods that are widely used in environmental, industrial, clinical, forensic, medical, and other areas allowing a rapid, simple and cost-effective analysis - qualitative, semi-quantitative and quantitative to be performed by trained as well as non-trained personnel. Some general characteristic features of test methods and test systems are described in the book, e.g. definitions, advantages and limitations, chemical and physical principles of operation, procedures and protocols, and methodological aspects. Application of test methods in various areas is extensively overviewed, and the test means and test tools pertinent for solving each concrete analytical task are discussed, e.g. paper strips, indicator powders and tubes, tablets, etc. The most important applications of test methods, evidently, are: testing for inorganic and organic components in water (mostly for purposes of environmental control), monitoring of toxic gases and alcohol vapours, detection of narcotics and explosives, determination of glucose, cholesterol, and other components of medical importance.